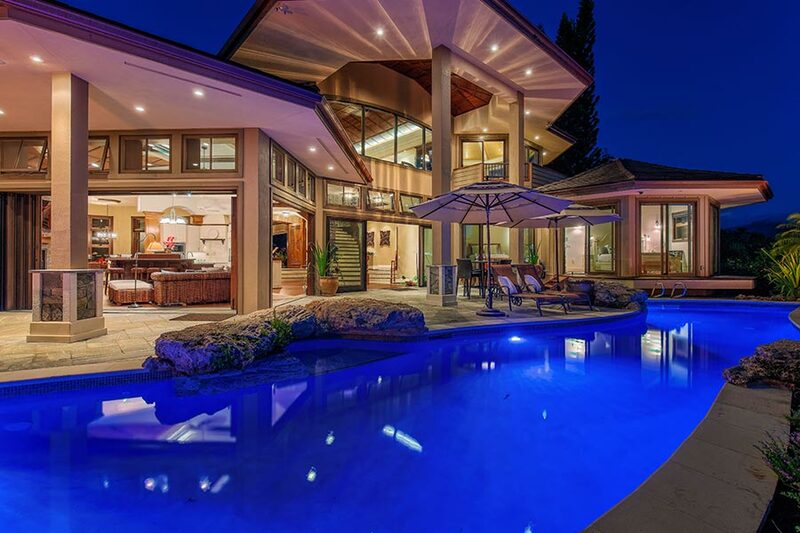 A Hawaiian residence that was awarded HGTV’s “Favorite Backyard Retreat” as part of the popular television network’s Ultimate House Hunt contest in 2015 has finally found a buyer. Luxury real estate auction firm Platinum Luxury Auctions has announced that the Princeville, Kauai property sold at a live auction on July 23rd. Platinum managed the transaction in cooperation with the property’s listing brokerage, Hawai’i Life Real Estate Brokers, which was represented by listing agents Ben Welborn and Tiffany Spencer. While the final sales price of the property will not be released until closing, Platinum confirmed that the price “easily surpassed” the auction’s $3 million reserve price. Although the HGTV accolades and affiliated press garnered the estate plenty of exposure, it remained listed for sale for several years with no viable offers. The owners finally realized they needed to take a more dynamic approach – such as a well-promoted auction – to find the right buyer for their custom home. Following an exhaustive vetting of leading real estate auction houses – they retained Miami-based Platinum for the sale. Once the auction was announced, buyers began paying attention immediately. The property sits on a secluded parcel of more than 1.5 acres in size. Its elevated location allows for panoramic views of Kauai’scoveted Hanalei Bay, in addition to an awe-inspiring landscape of natural waterfalls, verdant mountains, sublime sunsets, and even the occasional rainbow. It was these views, combined with the property’s impressive lanai – which includes a 50-foot saltwater pool and spa, a resort-style waterfall and grotto, multiple fire pits, and an outdoor kitchen – that earned the estate the HGTV award. Built in 2011, the property is comprised of a main residence and a separate guesthouse. In total, there is more than 5,700 square feet of living space, with 4 bedrooms, 4 full and 2 half baths, in addition to 2 outdoor showers. Interiors are luxurious yet relaxed, and feature materials sourced from around the world, including hand-hewn wooden flooring, Indonesian granite, Brazilian mahogany, and Italian stone. Additional amenities include state-of-the-art technology such as an indoor/outdoor wireless audio system, remote controlled sunshades, and custom lighting. Lesnock added that the all-cash, “AS-IS” sale is scheduled to close ahead of the prescribed, 30-day closing period. He described the buyer as a businessman from the United States. Those wealthy homebuyers seeking their own private retreat in the mountains, replete with a hot tub for 25 friends and an 18-hole putting course, needn’t look further than the Big EZ Lodge in Big Sky, Montana. Once listed for sale for as much as $24.5 million, the property will now be offered at a live auction to the bidder who meets or best exceeds the auction’s reserve bid price of only $4 million. The auction is scheduled for August 19th, and will be held on the property site. 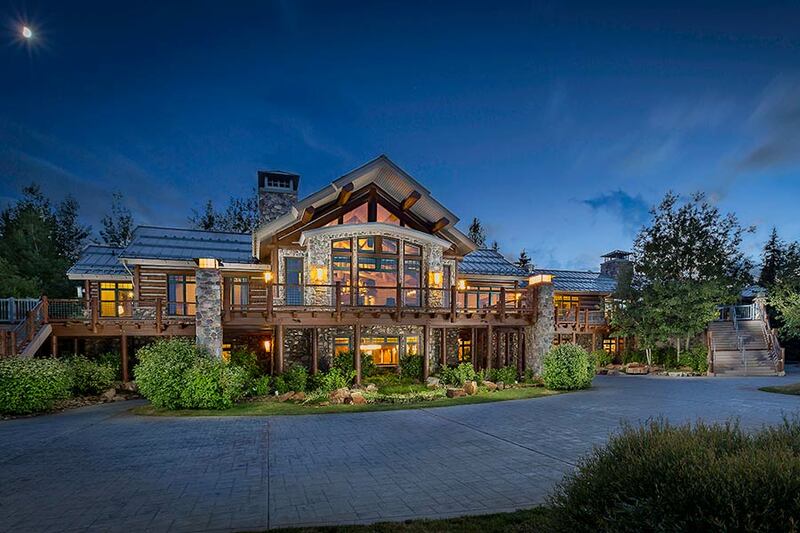 The transaction is being managed by luxury real estate auction firm Platinum Luxury Auctions, in cooperation with listing agency Realty Big Sky, of Big Sky, Montana. Listing agent Lesli Colis is representing Realty Big Sky for the sale. Situated on a sixty-acre parcel of rolling green hills, the Big EZ Lodge consists of three main living structures – the Main Lodge, Guest Inn and Lone Star Suite – in addition to caretaker’s quarters and a barn apartment. In total, the property offers nearly 23,000 square feet of living space, with 16 bedrooms, 17 full and 5 half baths. Posh amenities include a gourmet kitchen with commercial-grade appliances, private spa, fitness center, and beautifully designed common areas boasting a rustic-meets-luxury ambiance. More than 7,000 square feet of deck space and walkways provide plenty of opportunity to relax and enjoy the great outdoors, while keeping all of one’s creature comforts within arm’s reach. Grounds feature a massive hot tub with cascading waterfall that can seat up to 26 guests, an 18-hole putting course, two trout ponds, and 360-degree views of the breathtaking surroundings. The Big EZ Lodge was originally designed as a corporate retreat in 1997 by Texas entrepreneur R. Steven Hicks, a radio industry mogul whose company, AMFM, Inc., essentially became the predecessor to Clear Channel Communications. The name of the lodge is derived from “the Big Easy,” the nickname for New Orleans, an area of which Hicks and his wife are quite fond. After operating the estate for several years as a luxury bed and breakfast – earning the ninth spot in Andrew Harpers Hideaway Report’s “World’s Best Hotels, Resorts and Hideaways” in 2004 – the Hicks family remodeled the property and converted it into a private luxury retreat. They then decided to further develop and sell the land surrounding the Big EZ Lodge, creating the Big EZ Estates community, a private residential development consisting of only 53 home sites, each site ranging from 20-40 acres in size. The community is located only 15 minutes from the town center of Big Sky, and within 45 minutes of the Yellowstone National Park. The Hicks sold the property in 2013 to its current owner, a healthcare entrepreneur, who then retained Platinum for the resale of the property after the demands of his growing business diminished the time he was able to spend in Big Sky. Interested parties are encouraged to visit the lodge during open house previews, which will be held between the hours of 12-4pm MDT daily, until the auction. Additional information is available at the property’s dedicated webpage, BigSkyLuxuryAuction.com, or by calling 800.262.5132.